A young boy joins the bubble show. PICTURE: Shemeer Rasheed. 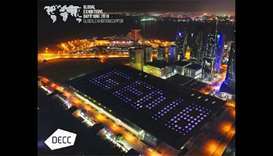 The five-day festival organised by the Private Engineering Office was a major attraction for families during the Eid holidays. Held inside an air-conditioned tent at the western part of Souq Waqif, the festival offered families and visitors many activities and events, such as different electronic and interactive games. Aside from the games and toys, the festival also showcased a number of eateries, cafes, and other services. 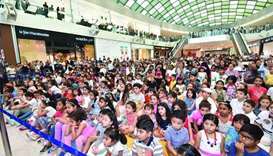 ‘It also featured some interesting theatrical performances that were highly-favoured by the kids,’ he said, adding that the festival charged reasonable fees for as low as QR10 per game. Another resident, Ahmed al-Hommas, said the festival featured more than 20 games, in addition to the other performances. He added that many people preferred Souq Waqif over other destinations such as shopping malls. 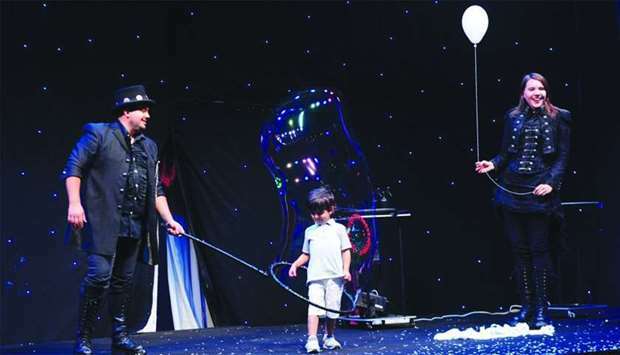 Qatari national Abdulrahman Jassim said the festival was successful in attracting a large number of visitors from all walks of life and ages due to the variety of performances, games, services, and other activities.